One of the prime purposes of CI+ matting is to absorb stress within tiled installations by absorbing lateral movements that occur in substrates. The decoupling action of the product is exceptionally effective in dealing with this type of movement, even for wooden substrates where the movement can be viewed as cyclical. Humidity and temperature can lead to repeated expansion and contraction of this difficult surface. 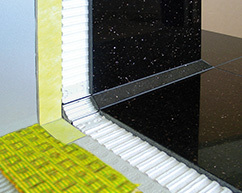 However where surfaces move vertically, CI+ matting offers no protection. This is best understood anecdotally. For example, a new extension to a building is undertaken where the tiled surface is required to run across both the old and new surface. In these circumstances the existing floor will probably be well established and stable. The new floor in the extension could be subject to settlement or general movement. Whatever the base material used to form the substrate in both floors CI+ matting will absorb any stress caused by horizontal movement. At the junction of the two substrates vertical movement is likely to occur. Even the smallest amount can cause tiles, (especially those of natural material), to crack at this point. CI+ matting cannot absorb this movement. Even overboarding both surfaces would not be guaranteed to remove this risk. The only safe answer to this situation is to fix a movement joint exactly at the junction point of the two substrates and carry it through the tiled surface as recommended by BS 5385. Some clients find the idea of a movement joint at this point less than ideal. We can offer help to reduce impact by providing a colour coordinated movement joint to match either the tiled surface or grout lines. (Minimum order 1 x 2.5mtr length). If this is unacceptable, the client must be advised, (preferably in writing), that no responsibility will be accepted if subsequent cracking occurs. 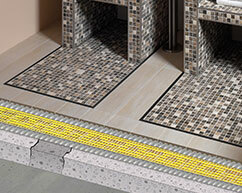 The above guidelines would also apply if the tiled area covers any other substrate movement joints. At these points CI+ matting should be split directly at the joint and a surface movement joint positioned directly in line above the subfloor / CI+ matting split. If no subfloor joints exist, then intermediate joints should be fitted at no more than 10mtr x 10mtr field size in non-heated floors and in heated floors no more than 40sqm the longest length no longer than 8mtr. 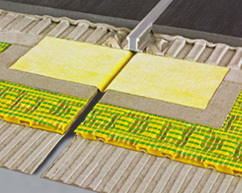 CI+ Matting absorbs horizontal movement very effectively. It cannot absorb the vertical movement that occurs where separate sections of subfloor abut.